Huus in 't Hagt is located in Aalten, Gelderland just a stone's throw from the German border. 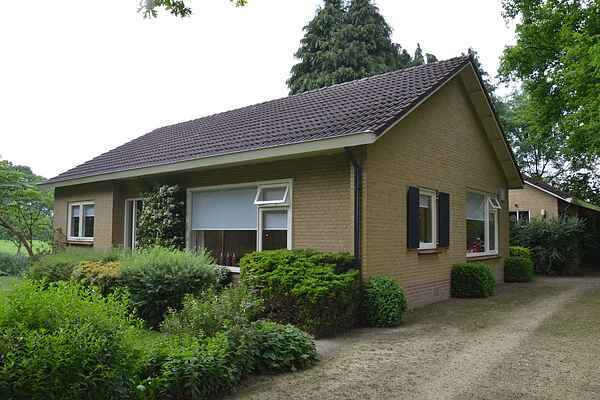 This holiday house is situated in the Achterhoek region, an area known for its natural environment. You can even spot wildlife, such as deer, when sitting on the little bench in the garden in the morning and evening. The holiday house is suitable for people with limited mobility; there are toilet rails in the bathroom, a shower chair, and no thresholds to deal with. The house's shed contains 5 bicycles that you can use during your stay. You can also safely store your own bikes in the garage. Cycling is a nice way to explore the natural beauty of the Achterhoek. The area also has no shortage of hiking trails. There are plenty of lovely hikes in the region, and there is an open border crossing for bikes and pedestrians just a few hundred metres away, so you can explore the German countryside as well. Places to visit in the area include the DRU culture factory in Ulft and Wunderland Kalkar, among other sights. And don't forget to visit the Slingeplas, a recreational pond where you can swim, sunbathe, surf and fish. Towns to visit for a fun daytrip include Winterswijk and Doetinchem on this side of the border and Bocholt in Germany.